This comfortable women's backpack is made in a family-run workshop in Ukraine. 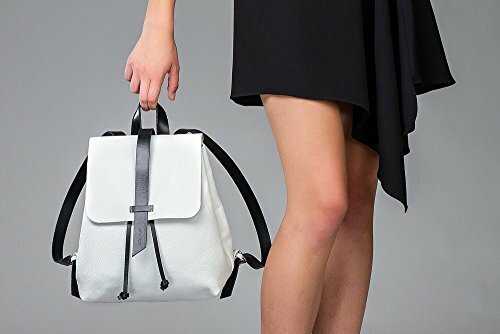 This stylish white backpack is suitable to any outfit. A versatile and laconic design allows you to wear this bag not only with everyday clothes but even in business casual style. Whatever you are going to work or study - this bag will accommodate all your necessary things. This model is crafted from a white supple leather (best quality Italian leather), so it will be worn for a long time and retain the original appearance. Shoulder straps, handle, the clasp is made of reliable belt leather (black color). The backpack does not require special care: you can take care of the leather with a piece of wet tissue. The size of the straps is adjustable. Other features include a leather drawstring closure, a press-magnetic stud closure, and an interior purse to keep your things safe.This model comes without lining. If you have any questions about this product by Author leather accessory, contact us by completing and submitting the form below. If you are looking for a specif part number, please include it with your message.